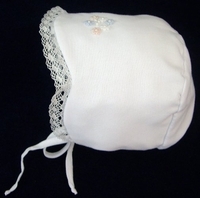 This beautiful new white cotton blend bonnet is made by Will'beth, a leading designer of beautifully detailed baby clothing. It features small embroidered flowers in either white (pictured below, right) or pastel pink, blue, and white (pictured above and below, left) centered by tiny seed pearls on the top of the bonnet. 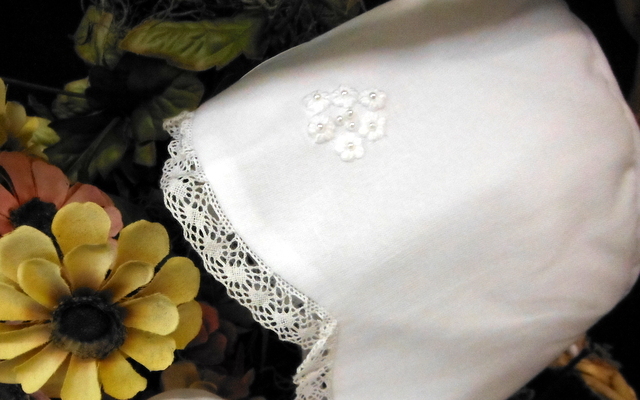 The scalloped front is finished with soft white cluny lace. The bonnet ties under the chin with batiste ties.